Why Open Brainstorm, by Laila Le Guen, licensed CC-BY. This image was done by a participant in the Why Open? course, a brainstorm mixing her views on why openness is important with those gathered from the survey discussed in this post. Laila shared it on Twitter on the #whyopen tag. 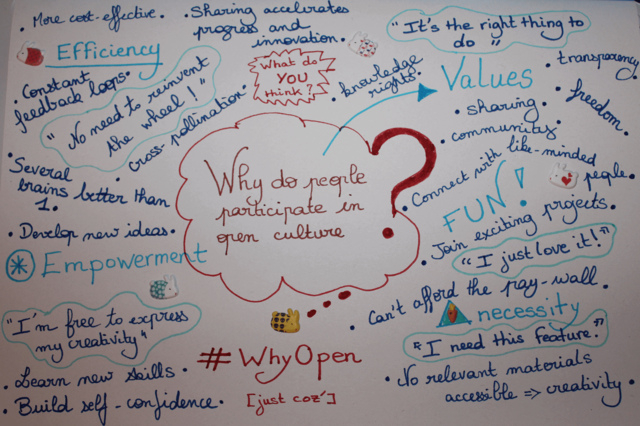 As part of a Why Open? course I’m helping to facilitate, we sent out a survey to gather different people’s views of what they think “openness” means–we were hoping to get answers from people in various professions. As part of the course, we asked participants to respond to some of these definitions in the discussion area for week 1, at the bottom of this page. But my comments are going to be so long that I think they’ll be easier to read in a blog post! So I’ll post a link to this blog post in that discussion area. We got 30 responses to the survey, which is quite a good number from something sent out for a couple of weeks on email lists, Twitter, and other social sites! You can see all the results of the survey in a couple of formats. Here you can see the answers to each question listed out under the question, and here is the spreadsheet where you can link question answers to the person who gave them (if they gave a name) and their profession. There’s another, similar survey focused on teachers/faculty and what openness means in the context of research and teaching, here, done for another purpose. It also provides some interesting results, but I’ll focus here just on the survey we did. I thought about trying to see if there were patterns amongst people with similar professions, but I’m not sure we have enough data to do that, really. There are quite a few different types of professions represented, so there aren’t that many people in each type of profession (except education and educational technology–there are a significant number of people in those fields). So I decided to keep track of some common answers, and then comment on some of the uncommon ones that I hadn’t considered before or found interesting for some other reason. Our first question was: What does “open” mean to you? I did not do a super careful job of coding the answers, so others may come up with different numbers if they try to put answers together into similar categories! It was kind of a rough coding/categorization. And I’m not attaching any great significance to these results–e.g., not suggesting that since these showed up quite often in our survey then it must be the case that most people who try to state their view of the meaning of “open” are going to have these in there. This was not at all a random sample. I include these just to give an idea of what one might often hear when people are talking about openness. 17 of the 30 respondents said that open had to do with allowing things to be reused, revised, changed, remixed, and the like. 16 of the 30 said something about openness being related to accessibility, without barriers in the form of cost, bureaucratic hurdles, or other obstacles. 13 said something about openness involving collaboration, ability for many people to participate in a practice or in creating a product. E.g., government being open in part by allowing for public input, public decisionmaking in some aspects; students being involved in open education, being consulted in how courses go and being able to have their own goals, paths through courses. A couple of people talked about institutions or practices being open to changing through feedback, and one noted that openness blurs the line between producers and consumers. 8 people said it had to do with sharing work, products, activities or process–one said it was a different form of file transfer than that done legally when there’s copyright and pirating. 8 people said something about transparency, or openness in communication, such as when governments are transparent about their processes, or that a practice is open if publicly documented. One person said that an important part of an open resource is that it makes clear that things are accessible, shareable, revisable, etc., and explains what those things mean in easy to understand terms (or links to a place that does so)–see dkernohan’s answer, here. Good point. Just because something is open and openly licensed for reuse and revision doesn’t mean people can easily find that information. I often see blogs that don’t clarify the license they have for their work, and without giving it an explicit license to the contrary, the default is copyright. If people want to share, they must be sure that a license and/or words stating so are prominent on their sites/artifacts. One nice thing about Creative Commons licenses is that they have versions of the licenses that are in somewhat easy-to-read language (easier than the full legal code, anyway). So, for example, the CC-BY license that I use has a more “readable” version, with a link to the full legal version. Other licenses may have similar–I haven’t looked into many licenses. I do think it’s important to not just say you’re using a license, but to link to it so people see the full terms, and if possible, to link to a version that explains it in somewhat clear language. And to make it prominent on your site. For those using CC licenses, this page is helpful for best practices in marking your work as CC-licensed. A nice plugin I’m using for my blog, that you can use if you have a self-hosted WordPress blog (can’t add plugins on WordPress.com blogs, I think), is Open Attribute. It allows you to put a site-wide license on, as well as different license for different posts. There is also a web browser plugin called open attribute, that does something different–it puts an icon into your URL bar that allows you to easily cite information, images, videos from pages that have CC licenses (you can copy and paste in plain text or html). Another person said that openness has to do (in part) with a “hacker ethic” (see @wiltwhatman’s answer, here). Though this may not be what that person had it mind, to me, a “hacker ethic” means that things are open to change, to being remade. But it being an “ethic” means a bit more than that. To me, it means that the more things that are open to remaking, remixing, the more likely it is that more people may eventually move from passive consumers of information and knowledge to active makers and sharers themselves. It there are a lot of things open to changing, and inviting people to use and change them, then perhaps this could encourage those who didn’t participate in making things as much in the past to start doing so. Especially if it doing so is fairly easy. For example, if an (open) educational resource like some slides from a presentation, or a digital animation that explains some process or concept is just available to reuse as is (so it’s open in that sense, but not in the sense of revision), then I can post it on a website for a course, or link to it, but I won’t be involved in adding or changing anything. And if most educational resources are like this, then I’ll be rather passive when dealing with things other people have made. But if there are a lot of OER’s that invite revision, remixing, then I may be inspired to change them so they fit my course better. And in this way I might make more things myself because while starting from scratch may be too much work, changing something someone else has created may not be. Again, depending on how easy it is to revise such things, and whether I have the right software knowledge, etc. It won’t be enough in itself to encourage more people to make things, but it might help. Another person asked an interesting question: “I share because I believe it to be a good thing. Is sharing innately open? Not so sure.Not so sure” (see Pat’s answer, here). I guess I just assumed sharing is open, but it probably depends on what is shared and how. And on what “sharing” means. Because if, let’s say, offering a free version of an app is “sharing,” but it’s not open to revision, then that’s not terribly open. And also if the free version is there mainly to get you to try it and then buy the paid version. That may not be what this person meant, though. I’m curious–can you think of ways in which sharing might not be “open”? Please respond in the comments, if you’d like! We also asked in the survey if people wanted to provide us with links to a project or site that exemplifies their views of “open.” It’s best just to go to the survey results themselves to see these, because some have nice explanations attached! Some great resources there. Thank you to those who took the time to fill out our survey! Posted in WhyOpen? 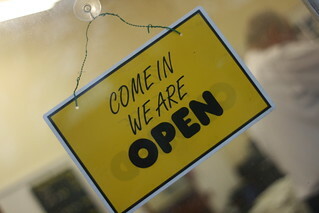 and tagged meaning of open, openness on August 12, 2013 by Christina Hendricks. That’s pretty much what I meant by the hacker ethic. Better put, by far, than I would have managed. But it’s pretty much what I meant. Yep. In fact, when people ask me what I mean, I’ll just send them here.